I've found a way to beat the Monday blues - bring on the greys! 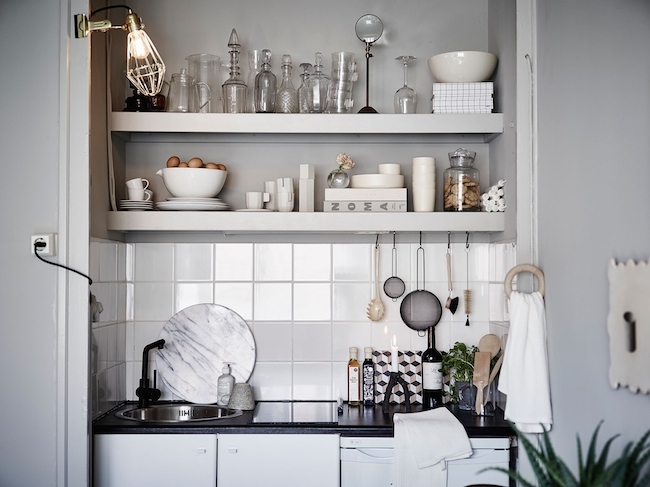 This home is the absolute picture of calm with it's all grey colour pallette. And looking at the home tour you'd never guess it's only 25 metres square (270 feet square) - which is itsy bitsy! So what's the trick? Joanna Bagge has decorated it with the same colour theme throughout which gives the space a sense of coherence, the sofa cushions are stored under the sofa-bed by night - ready for the daytime transformation. The dining table is extendable for guests. 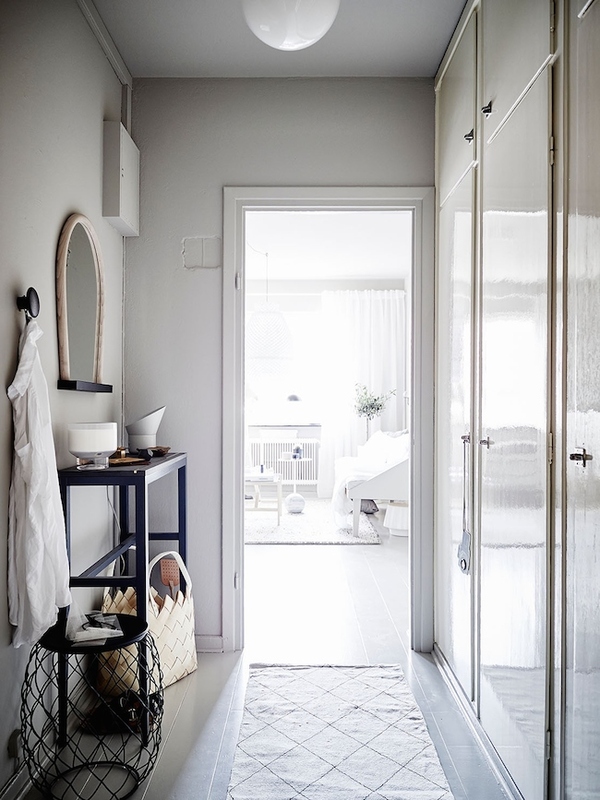 Wall to ceiling wardrobes have been installed the entire length of the hallway, and the entire home is clutter free. And I bet there's a TV hiding in that lovely cupboard - what do you reckon? 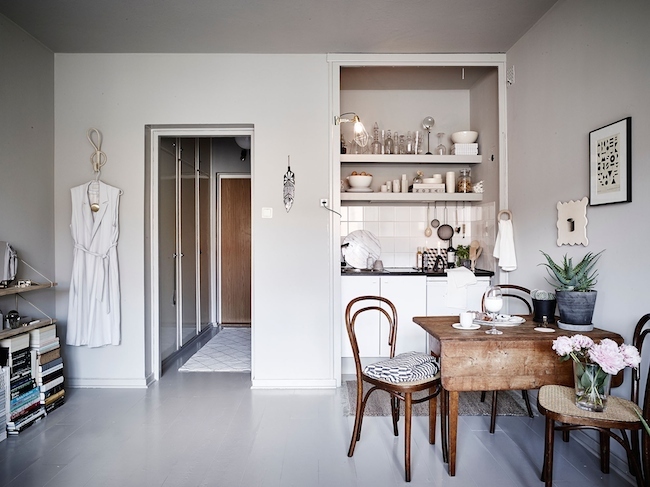 Wonderful inspiration for anyone living in a small space or loving grey today! I could kick of the week here, how about you? I see they've got a book on noma - one of the world's finest restaurants, in Copenhagen. Oh how I'd love to go! Have you been? Other details I love - the fresh bunch of peonies on the chair ('tis the season - yay! 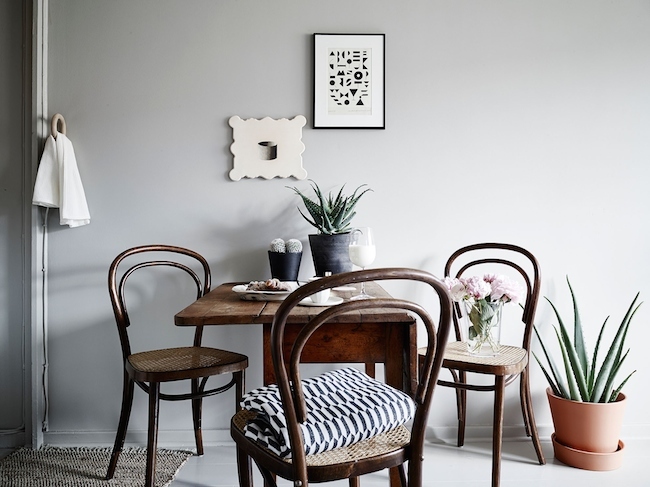 ), the bentwood Thonet chairs. Miro miro mirror. Angle cushions / pillow. Hay gym hook (used as towel hook), House Doctor shelves with brass fittings. Hay Bent Wood mirror, Pina low table and beech tote bag (in hallway). Hay work lamp in brass. Artecnica Trianen pendant light. Soft linen bedding. 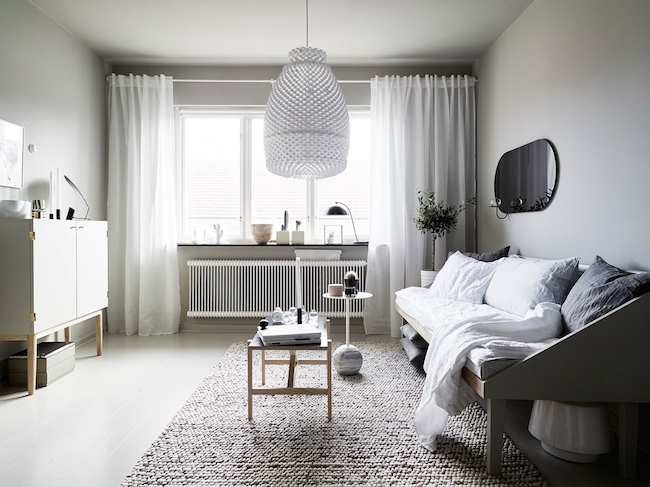 Try Strong White for a similar floor colour. 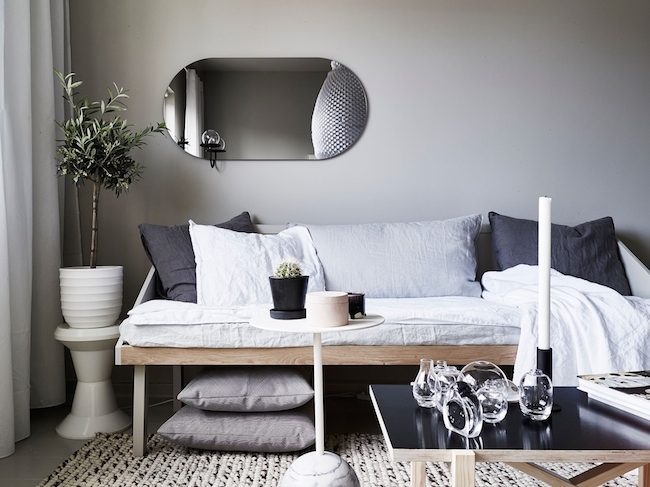 If you're after more grey inspiration today I'm loving this Stockholm pad, a fabulous all grey Australian home and a small Swedish space. I absolutely LOVE your interiors posts. They are beautiful, filled with wonderful, do-able ideas. I look forward to seeing them every time! But I wonder if there might be someone out there willing to jump on the bandwagon and write a seminal book on "Interiors Greys"! How long will the ubiquitous grey theme continue, I wonder. 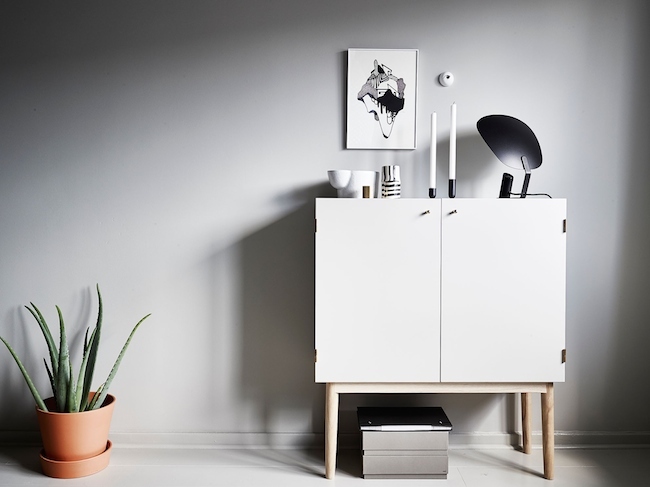 Again, with respect, from an avid fan of My Scandinavian Home. Now that would make a fab book! What a great idea....And thank you for your lovely words about my blog. Do you know where that sofa/bed comes from? Lovely apartment! Unfortunately Yolanda, hopefully someone else can help advise? It's really fab! Hi, we love the rug underneath the sofabed, and also the white cupboard in the same room. Where can we obtain these? Hi Simone - I love the cupboard too - it's one of the items that really struck me when I saw the home tour - but sadly I don't know where it's from - I hope somewhere else on here can help us, same for the lovely rug too....? anyone..?! Hi, I love your blog- it is so pretty and inspiring. 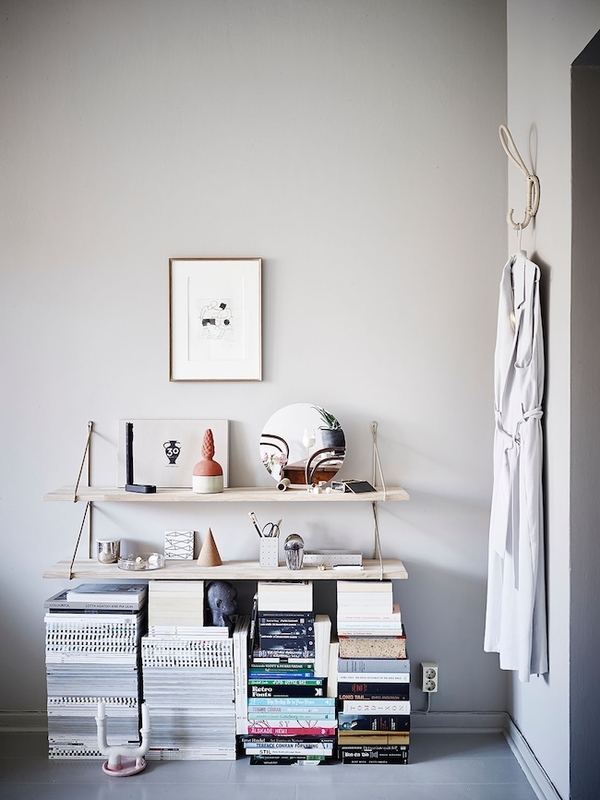 I am wondering if you know the name of the grey colour used in this apartment- It is perfect. Thanks. Hello, sorry for the delay - thank you for your kind words about my blog. Unfortunately not, however you could ask the friendly guys at Farrow & Ball for help? Best of luck with your project.